DCD Group comprises four different divisions: rail, mining and energy, marine, and defense. DCD Group’s headquarters have 1300 full-time employees, which equates to a large number of purchase requisitions that need to be created, submitted and approved on a regular basis. Here is how the DCD Group used Laserfiche Forms and Laserfiche Workflow to make the purchase requisition process paperless from start to finish. Before Laserfiche, purchase requisitions were filled out by hand. An employee would look up department and expense codes and write them in. Once a purchase requisition was filled out, it had to be signed by a manager to signify approval. A particular manager can only approve a purchase requisition for a certain amount. The larger the amount on the purchase requisition, the higher up in the hierarchy the manager must be to approve it. For example, while a requisition for R5,000 can be approved by the line manager, one for R25,000 must be approved by the general manager. This paper process was inefficient and laborious because it required the employee to find the manager, make sure he is free, and obtain his signature. Often, the expense and department codes were incorrect and the writing on the form was difficult to read. An employee logs into Laserfiche Forms and opens the Purchase Requisition form. The employee fills out the form. Each purchase requisition has a unique “PR No” which is automatically assigned. 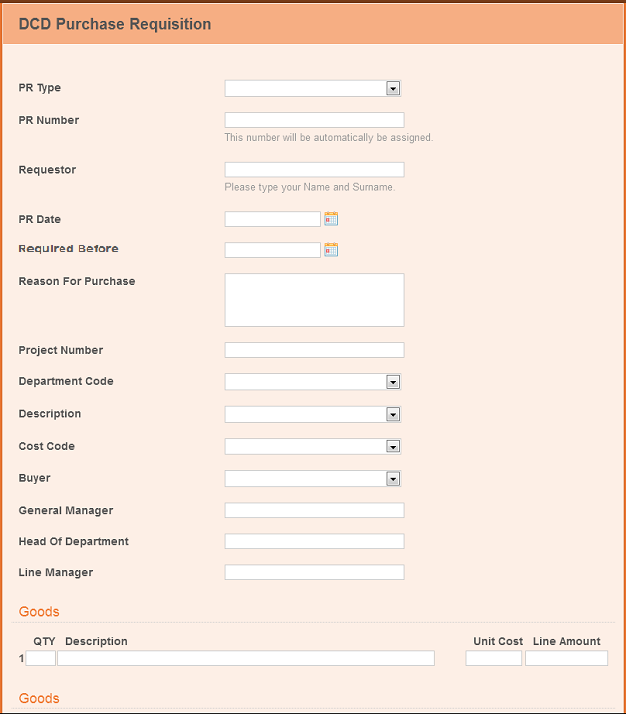 Certain fields, such as Department Code, Description, Cost Code and Buyer are drop-down fields. The form uses database lookup rules to help fill out the Line Manager, Head of Department and General Manager fields based on the department code. 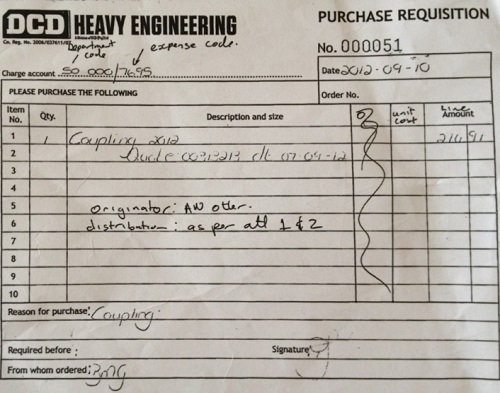 An employee can upload a supplier quotation document, if one is already available, directly from the form. The employee can save the form to finish later if he needs to obtain additional information. Once the form is submitted, it is converted into Tiff format and stored in Laserfiche along with the supplemental supplier quotations (if any). 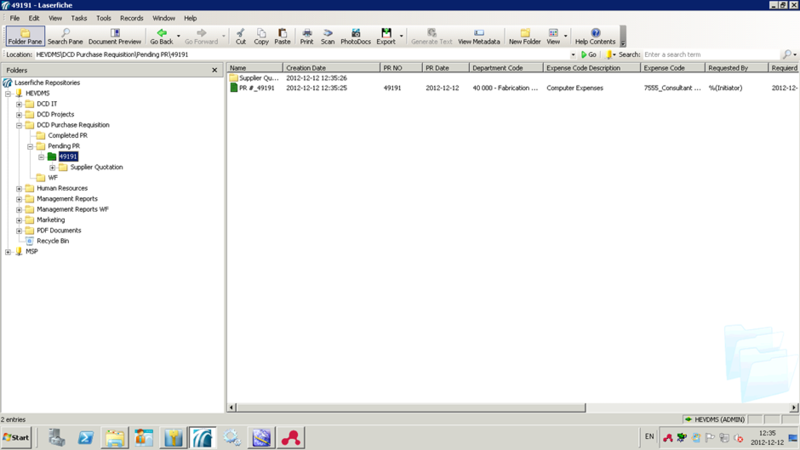 Laserfiche Workflow monitors the folder for new form submissions. The workflow extracts the data from the form fields and converts them into tokens using the “Retrieve Laserfiche Form Content” activity. The manager can view all the information on the purchase requisition by simply looking at the various columns in the folder browser. 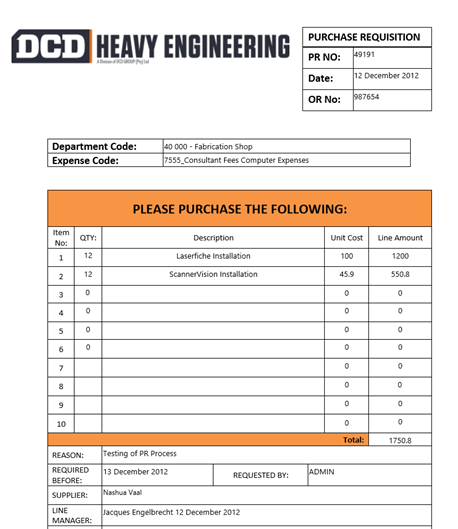 He can also automatically see the related supplier quotations in the “Supplier Quotation” folder. The final product requisition is moved to the “Completed PR” folder in the Laserfiche repository. Automating the purchase requisition process has resulted in the following benefits for the DCD Group. Productivity has improved significantly because employees no longer have to chase down managers to obtain signatures. All documentation is easily accessible because it is electronic and stored in a single location. 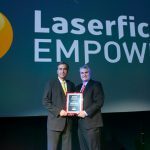 Laserfiche is so easy to use that it took Support Services only four days to roll out the whole process within the organization.